Elba is the biggest island of the Tuscan Archipelago and the third largest in Italy after Sardinia and Sicily. Together with eight other islands, including Giglio, Giannutri and Montecristo, it is part of the National Park of the Tuscan Archipelago, the largest marine park in Europe. The island of Elba is famous around the world for harboring French Emperor Napoleon in 1814 during his exile. But its history goes back to prehistory, with the Ilvati tribe from Liguria who named the island Ilva. It was then inhabited first by the Etruscans and later by the Romans, who really appreciated the island and its rich deposits of iron and its mud baths. There are several memories of its glorious past as we visit the island, from the archaeological findings in its museums to the impressive fortresses and military constructions such as Castello del Volterraio and then on to the beautiful Napoleonic residences of the 1800s such as Palazzina dei Mulini. What really makes Elba famous and renowned are its clear and blue sea and beautiful beaches. The extraordinary richness of its landscapes, both land and marine, turns the island of Elba into a unique destination in Tuscany. We can say that is a heaven on earth, with nothing to envy of more exotic Caribbean destinations. In addition, Elba is the perfect place for outdoor sports and activities. Among the most appreciated sports, there is diving and snorkeling in Elba, thanks to its rich seabeds housing lots of different species of fish. But outdoors lovers can also enjoy spending time on land hiking and mountain biking, enjoying a round of golf, a day of sailing or enjoying days of complete relaxation at the thermal baths of San Giovanni. 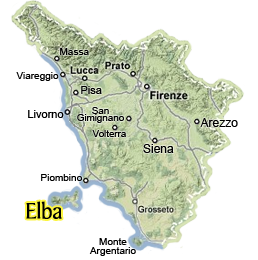 Here's another excellent resource on the Elba island and what you can see and do on the island of Elba! Most everyone arrives on Elba through the port at Portoferraio and then heads off to other parts of the island. But the small "capital" of the island has more to offer: read more to discover what to see and to do in Portoferraio. Learn a bit more about the Elba Island, with some short notes on its history, layout, beaches and most popular attractions - and most important of all - how to get there and enjoy it! Elba has a wide variety of beaches, from long white sandy beaches to granite or black pebble beaches. If you're looking for a beautiful, relaxing vacation in Tuscany, head to Elba. Napoleon Bonaparte spent only nine months in exile on the island of Elba, but his arrival marked the history of the island. Where did the Emperor live on the Island? Which are the so-called "Napoleonic places" on Elba? Follow our itinerary on the footsteps of Napoleon and find out! A small guide to the Elba Island with many useful information about outdoor sports and tips on main sights of one of the most beautiful islands of the Tuscan Archipelago. The island of Elba is one of the most beautiful paradises for snorkeling in Italy. The sea beds are extremely rich in fishes and marine flora. You can easily find eels, groupers, blue fishes and starfishes, including the rare sunfish and red coral. If you are visiting Elba, don't miss Capo Sant'Andrea. This small cape in the area of Marciana has great beaches, impervious cliffs and startling blue water. It's the perfect place for lovers of sport activities.